A large number of computational methods have been proposed for predicting protein functions. The underlying techniques adopted by most of these methods revolve around predicting the functions of an unannotated protein p from already annotated proteins that have similar characteristics as p. Recent Information Extraction methods take advantage of the huge growth of biomedical literature to predict protein functions. They extract biological molecule terms that directly describe protein functions from biomedical texts. However, they consider only explicitly mentioned terms that co-occur with proteins in texts. We observe that some important biological molecule terms pertaining functional categories may implicitly co-occur with proteins in texts. Therefore, the methods that rely solely on explicitly mentioned terms in texts may miss vital functional information implicitly mentioned in the texts. To overcome the limitations of methods that rely solely on explicitly mentioned terms in texts to predict protein functions, we propose in this paper an Information Extraction system called PL-PPF. The proposed system employs techniques for predicting the functions of proteins based on their co-occurrences with explicitly and implicitly mentioned biological molecule terms that pertain functional categories in biomedical literature. That is, PL-PPF employs a combination of statistical-based explicit term extraction techniques and logic-based implicit term extraction techniques. The statistical component of PL-PPF predicts some of the functions of a protein by extracting the explicitly mentioned functional terms that directly describe the functions of the protein from the biomedical texts associated with the protein. The logic-based component of PL-PPF predicts additional functions of the protein by inferring the functional terms that co-occur implicitly with the protein in the biomedical texts associated with it. First, the system employs its statistical-based component to extract the explicitly mentioned functional terms. Then, it employs its logic-based component to infer additional functions of the protein. Our hypothesis is that important biological molecule terms pertaining functional categories of proteins are likely to co-occur implicitly with the proteins in biomedical texts. We evaluated PL-PPF experimentally and compared it with five systems. Results revealed better prediction performance. Determining protein functions has been one of the central objectives for bioinformaticians, especially after the post-genomic era. This is because proteins have key roles in many biological processes. Identifying protein functions using experimental approaches is laborious and time consuming. Therefore, computational methods have been used extensively as alternatives. The underlying techniques adopted by most of these approaches revolve around computing protein functions from already annotated proteins. Most of them reference already annotated proteins using their structures , sequences , and/or interaction networks. The key limitation of these approaches is that they require highly reliable predictor algorithms. Recent computational methods exploit the huge growth of biomedical literature to predict protein functions from the information of already annotated proteins that appear within the literature. Some of them extract from the literature texts any information that describes proteins . Others extract only information that describes the functions of proteins [2, 5, 7, 10, 28]. We observe that some important biological molecule terms pertaining functional categories may implicitly co-occur with proteins in texts. Therefore, the methods that rely solely on explicitly mentioned terms in texts may miss vital functional information implicitly mentioned in the texts. Towards this, we propose in this paper an Information Extraction system called PL-PPF (Predicate Logic for Predicting Protein Functions) that employs techniques for predicting the functions of proteins based on their co-occurrences in texts with explicitly and implicitly mentioned biological molecule terms pertaining functional categories. PL-PPF infers the implicit terms using the rules of predicate logic. It does so by triggering protein specification rules recursively in the form of predicate logic’s premises . It extracts the explicit terms by employing Natural Language Processing (NLP) techniques that compute the semantic relationships among the biological terms in sentences. Using known protein and biological characteristics, PL-PPF composes rule-based protein specifications. These specifications are known protein characteristics in literature. PL-PPF composes these specifications in a pattern similar to predicate logic’s premises . It triggers them by applying the standard inference rules for predicate logic. It does so to deduce functional relationships between proteins. Ultimately, these deduced relationships enable PL-PPF to predict the functions of unannotated proteins. Let Pu be an unannotated protein. Let Lc be a list of known protein characteristics represented in the form of predicate logic’s premises . PL-PPF would first extract biological molecule terms related to Pu based on their co-occurrences in biomedical texts. It extracts the semantically related biological molecule terms to Pu in the sentences of the texts by employing linguistic computational techniques. It would then utilize these extracted terms as identifiers to serve as triggers for the appropriate premises from the list Lc using the standard rules of inferences [8, 16]. The conclusion of this process is a functional category term that co-occurs implicitly with Pu in the texts. Similar to our approach, a number of studies employed logic-based approaches as complementary to statistical approaches to perform some biological-related tasks. For example,  demonstrated that logic models can be used as complementary to statistical analysis models to identify fundamental properties of molecular networks and to perform biological inferences about the dynamics of intracellular molecular networks. As another example,  demonstrated that logic-based approaches are useful for improving static conceptual models in molecular biology. The paper demonstrated that adding logic-based approach can improve the Central Dogma information flow. Logic-based approaches have been successfully applied to solve complex problems in bioinformatics by viewing these problems as binary classification tasks. For example,  achieved acceptable results for predicting protein structures using constraint logic programming techniques. presented a methodology that successfully predicted the tertiary structure of a protein using constraint logic programming. used logic based multi-class classification method to accurately solve the problem of protein fold recognition. It accurately assigned protein domains to folds. Using known biological characteristics, PL-PPF composes rule-based protein specifications. It composes these specifications in a pattern similar to predicate logic’s premises . “Representing protein specification rules in a pattern similar to predicate logic’s premises” section describes this process in detail. PL-PPF employs computational linguistic techniques to extract the biological molecule terms that are semantically related to an unannotated protein pu based on their explicit co-occurrences in texts. If an extracted term denotes a functional category f, PL-PPF will assign pu the function f. PL-PPF will also use the extracted term to serve as a given premise and apply it as a trigger identifier for the appropriate protein specification rules to identify additional functions of pu. “Extracting biological molecule terms that cooccur explicitly with an unannotated protein in biomedical texts” section describes this process in detail. PL-PPF will assign pu the functional terms that co-occur implicitly with pu in the texts by recursively triggering the appropriate premises constructed in step 1 and the given premises extracted in step 2 using the standard rules of inference for predicate logic. The conclusion will be a functional category that co-occurs implicitly with pu in the texts. “Inferring the functional terms that cooccur implicitly with an unannotated protein in texts using predicate logic” section describes this process in detail. Premise R1 is constructed based on the following protein characteristics: (1) the folding of a protein takes place after a sequence of structural changes (the final stage of folding determines the structure of the protein) , and (2) the structure of a protein defines the function of the protein . Premises R2 and R3 are constructed based on the following protein characteristic: each protein’s sequence is unique and defines the structure and function of the protein . Premise R4 is constructed based on the following protein characteristics: (1) the covalent bonds of a protein contribute to its structure , and (2) the raw sequence of a protein’s amino acids determines its structure . Premise R5 is constructed based on the following protein characteristic: a protein’s non-covalent interaction folding and dimensional structure can define the protein’s biological function . Premises R6 is constructed based on the following protein characteristic: protein-protein interactions form complexes by interacting with one another . Premises R7 and R8 are constructed based on the following protein characteristics: (1) a complex assembly can result in a new function that neither protein can provide alone (the combined functionalities of the interacting proteins determine the new function) , and (2) the interacting proteins carry out their functions in the complex (the functions of the individual interacting proteins can be determined from the new complex assembly function) . Premise R9 is constructed based on the following protein characteristics: (1) proteins can be classified based on the similarities of their structural domains , (2) the structure of a protein reveals an insight into its function , and (3) the function of a protein p can be inferred from the functions of proteins that fall under the same structural classification as p .
Premise R10 is constructed based on the following protein characteristics: (1) proteins can be classified based on the similarities of their amino acid sequences , and (2) the function of a protein p can be inferred from the structures of the proteins that fall under the same amino acid sequence classification as p .
Premise R11 is constructed based on the following protein characteristic: the sequence of a protein’s amino acids is inferred from the combination of the protein’s covalent interactions with ligands and the protein’s function . Premise R12 is constructed based on the following protein characteristic: non-covalent bonds between proteins during their transient interactions lead to Protein-Protein Interactions . Premise R13 is constructed based on the following protein characteristic: the structure of a protein can reveal an insight into its amino acid sequence . PL-PPF extracts the biological molecule terms that co-occur explicitly with an unannotated protein pu in the sentences of biomedical texts. If an extracted term denotes a functional category f, PL-PPF will assign pu the function f. PL-PPF will also use the extracted term to serve as a given premise and apply it as a trigger identifier for the appropriate protein specification rules to infer the functional category that co-occurs implicitly with pu in texts. The co-occurrence of a biological molecule term and pu in a sentence does not guarantee that this term and pu are associated. To be associated, the term and pu have to be semantically related in the sentence. We consider a term as semantically related to an unannotated protein, if their co-occurrence probability of being related is significantly larger than their co-occurrence probability of being unrelated in texts. PL-PPF computes the occurrence probabilities of terms using Z-score . For two terms in texts associated with an unannotated protein to be semantically related, the co-occurrences of the same terms in the training dataset stored in PL-PPF’s database should be considered semantically related. We use the term “training dataset” to differentiate between the following: (1) the set of biomedical texts stored in PL-PPF’s database, and (2) the set of biomedical texts associated with an unannotated protein, whose functions need to be annotated. To differentiate between the two, we call the texts stored in PL-PPF’s database a “training dataset”. In order for two molecule terms in texts associated with an unannotated protein to be semantically related, they have to be semantically related in the texts stored in the database (i.e., the training dataset). Based on linguistics, two nouns are considered related within a sentence, if they are connected by a pronoun (e.g., “that”, “who”, “which”) . PL-PPF adopts a semantic rule based on the above observation for extracting semantically related biological molecule terms. Based on linguistics, two nouns are considered unrelated within a sentence, if they are connected by a preposition modifier (e.g., “whereas”, “but”, “while”) [13, 24]. PL-PPF adopts a semantic rule based on the above observation. PL-PPF computes the functions of an unannotated protein p implicitly using the following: (1) the protein specification rules (i.e., premises) described in “Representing protein specification rules in a pattern similar to predicate logic’s premises” section , (2) the biological molecule terms (i.e., given premises) that co-occur explicitly with p in biomedical literature and described in “Extracting biological molecule terms that cooccur explicitly with an unannotated protein in biomedical texts” section , and (3) the standard inference rules for predicate logic. PL-PPF can infer the functions of p by recursively triggering the protein specification rules using the premises (i.e., extracted terms) and the standard inference rules for predicate logic. At each recursion, an inference rule is triggered and applied to the premises that have been proven previously. This will lead to a newly proven premise. The final conclusion will be a protein function, which will be considered as the function of p. The conclusion is valid, if it has been deducted from all previous premises . Table 2 presents the standard inference rules for predicate logic. We now present case studies in Examples 1 to 4 to show the effectiveness of the deductive inferencing methodology presented in this section. The examples use various biological molecule terms as given premises for inferring the functions of unannotated proteins. Consider that PL-PPF extracted the following terms based on their co-occurrences with an unannotated protein Pu in biomedical texts after applying the techniques presented in “Extracting biological molecule terms that cooccur explicitly with an unannotated protein in biomedical texts” section: FD(Px) and ST(Px) (recall Table 3). Using inference rules, we show how the co-occurrences of FD(Px) and ST(Px) in texts can be indicative of an implicit mentioning of the function of Px (i.e., F(Px)). Therefore, the co-occurrences of FD(Px), ST(Px), and Pu can be indicative of an implicit co-occurrences of F(Px) and Pu. Accordingly, the functions of Pu is likely to be similar to F(Px). Table 4 shows the inference rules, which conclude that the given premises FD(Px) and ST(Px) are indicative of F(Px). Consider that PL-PPF extracted the following terms based on their explicit co-occurrences with an unannotated protein Pu in biomedical texts: AAS(Px) and AAS(Py) (recall Table 3). Using inference rules, we show how the co-occurrences of AAS(Px) and AAS(Py) in texts can be indicative of implicit mentioning of the functions of Px and Py (i.e., F(Px) and F(Py)). Therefore, the co-occurrences of AAS(Px), AAS(Py), and Pu can be indicatives of implicit co-occurrences of F(Px), F(Py), and Pu. Accordingly, the functions of Pu is likely to be similar to F(Px) and F(Py). Table 5 shows the inference rules, which conclude that the given premises AAS(Px) and AAS(Py) are indicative of F(Px) and F(Py). Consider that PL-PPF extracted the following term based on its explicit co-occurrences with an unannotated protein Pu in biomedical texts: ST(Px) (recall Table 3). Using inference rules, we show how the co-occurrences of ST(Px) in texts can be indicative of implicit mentioning of the function of Px (i.e., F(Px)). Therefore, the co-occurrences of ST(Px) and Pu can be indicatives of implicit co-occurrences of F(Px) and Pu. Accordingly, the functions of Pu is likely to be similar to F(Px). Table 6 shows the inference rules, which conclude that the given premise ST(Px) is indicative of F(Px). Consider that PL-PPF extracted the following terms based on their explicit co-occurrences with an unannotated protein Pu in biomedical texts: NCBND(Px, Py) and F(Px) (recall Table 3). Using inference rules, we show how the co-occurrences of NCBND(Px, Py) and F(Px) in texts can be indicative of implicit mentioning of the function of Py (i.e., F(Py)). Therefore, the co-occurrences of NCBND(Px, Py), F(Px), and Pu can be indicative of implicit co-occurrences of F(Py), and Pu. Accordingly, the functions of Pu is likely to be similar to F(Py). Table 7 shows the inference rules, which conclude that the given premises NCBND(Px, Py) and F(Px) are indicative of F(Py). We implemented PL-PPF in Java and used Prolog as the logic programming language. We ran it on Intel(R) Core(TM) i7 processor and a CPU that has frequency equals 2.70 GHz. The machine has 16 GB of RAM. We ran PL-PPF using Windows 10 Pro. We compared it experimentally with the following five systems: DeepGO , IFP_IFC , Text-KNN , Text-SVM , and GOstruct [9, 26]. DeepGO  uses deep learning to learn features from protein sequences for the purpose of predicting protein function. IFP_IFC is a system that we proposed previously for predicting the functions of unannotated proteins by employing random walks with restarts on a protein functional network. The nodes of the network denote the functional categories of proteins and the edges denote the interrelationships between them. 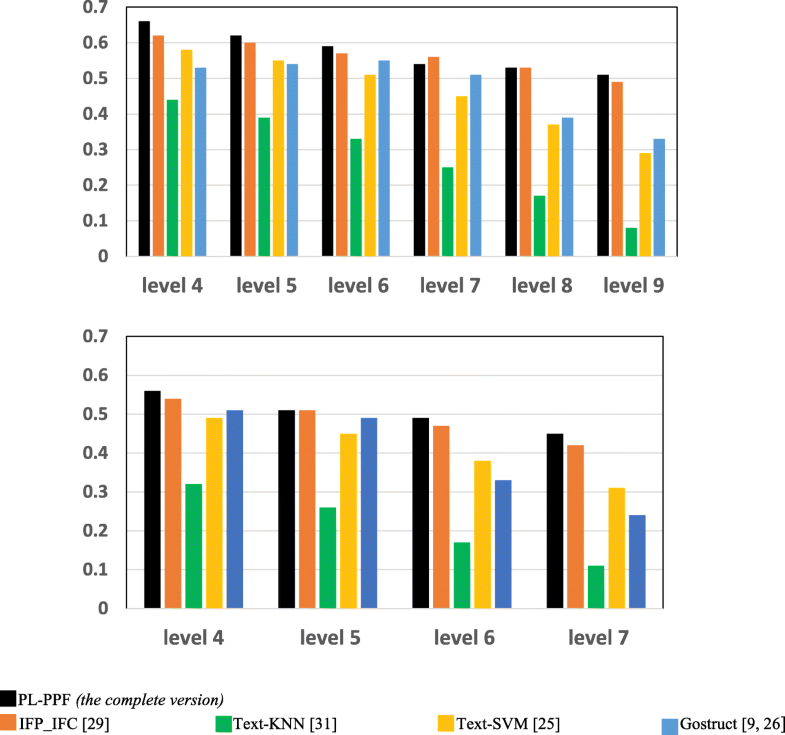 Text-KNN and Text-SVM use characteristic terms, which are text features obtained from biomedical texts to represent proteins. The two systems assign an unannotated protein pu the functions of the set S of already annotated proteins, if pu and S have similar characteristic terms. The classifier employed by Text-KNN is based on k-nearest neighbour and the classifier employed by Text-SVM is based on support vector machine. In the framework of GOstruct, an unannotated protein pu is annotated with the functions of a Gene Ontology (GO) term, if this term co-occurs in close proximity with pu in biomedical texts. We compared the systems using GO dataset , which contains GO terms as well as proteins annotated with their functions. We extracted a fragment from the biological process ontology that has 70 GO terms. We also extracted a fragment from the molecular function ontology that has 30 GO terms. We downloaded the GO dataset from . The number of downloaded proteins (which are annotated with the functions of the selected terms) is shown in Table 8. We downloaded the PubMed texts associated with the selected proteins based on their entries in . The number of downloaded texts was 577,486. PL-PPF will use these 577,486 texts as a training dataset for extracting the semantically related GO terms to the selected proteins. We considered a term t to be semantically related to an unannotated protein pu, if the co-occurrence probability of t and pu using Z-score  is greater than “-1.96” standard deviation (with 95% confidence level). a We selected for the evaluations only proteins that satisfy the following: (1) associated with at least one PubMed publication based on their entries in UniProtKB , and (2) have experimental evidence code: IC, IDA, IPI, IEP, EXP, TAS, IMP, IGI, or IC. We also compared the systems using the 6086 SGD dataset . The dataset is a complete information about the yeast proteins. The functions of these proteins have been experimentally determined by manual curation and verified using peer-reviewed process. We downloaded 46,227 PubMed texts associated with the SGD dataset based on their entries in . Cp: The number of correctly predicted functions for protein p.
Np: The actual number of correct functions of protein p.
Mp: The number of functions predicted for protein p by one of the systems. Figures 1 and 2 show the results achieved by each system using the GO dataset and SGD datasets respectively. Table 9 shows the number of valid and invalid co-occurrences identified by PL-PPF in the GO and SDG datasets. We also assessed each system for accurately inferring the functions of each GO term at different hierarchical levels (depths) of the GO ontology. The size of proteins annotated with the functional category of a GO annotation term decreases as its hierarchical level increases. We aim at investigating whether the accuracy of a system for predicting the functional categories of GO annotation terms gets better as the sizes of these terms increases. We randomly divided the proteins annotated with each functional category c into two sets. We considered the proteins in the first set as unannotated, whose functions need to be detected. We considered the biomedical texts associated with the proteins in the second set as a training dataset. We computed the performance of each system for predicting the functions of c at different hierarchical levels. Figures 3 and 4 show the results achieved by each system. We ran each system ten times against the GO dataset. The number of proteins, whose associate biomedical texts are used as a training dataset, keeps accumulating at each run. At each run, we randomly selected 1000 Biological Process testing proteins and 500 Molecular Function testing proteins as unannotated and assessed the systems for predicting their functions. The first run was performed using: (1) 52,386 Biological Process proteins and 11,576 Molecular Function proteins, whose associate biomedical texts are used as a training dataset, and (2) 1000 Biological Process proteins and 500 Molecular Function proteins, whose functions are considered unannotated. At each run, thereafter, the set of proteins, whose associate biomedical texts are used as a training dataset, includes also the Biological Process and Molecular Function proteins, whose functions were annotated in the prior run. Figures 5 and 6 show the results achieved by each system. The protein centric maximum F-measure, which was used in evaluating the DeepGO method. The same GO dataset used in evaluating the DeepGO method (the dataset is shown in Additional file 1: Table S2 of ). Figure 7 shows the protein centric maximum F-measure of PL-PPF and DeepGO for predicting the functional categories of the GO dataset described in . As Figs. 1, 2, 3, 4, 5, 6 and 7 show, PL-PPF outperformed the other systems. This is an indication of the effectiveness and practical viability of PL-PPF’s combination of explicit and implicit techniques (i.e., its techniques for inferring functional terms that co-occur implicitly with proteins using the rules of predicate logic as well as its techniques for extracting functional terms that co-occur explicitly with proteins). 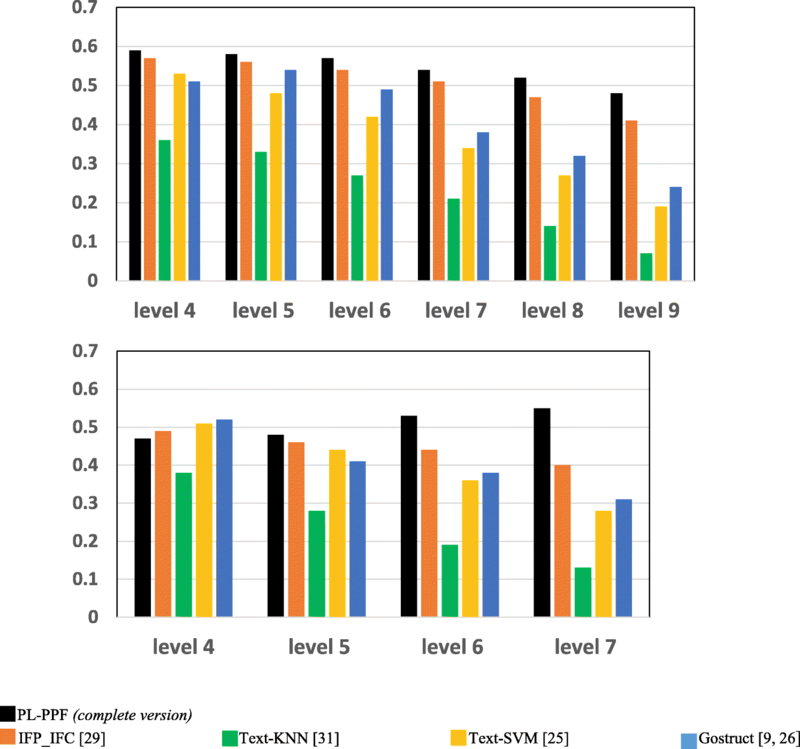 As the figures show also that the complete version of PL-PPF (i.e., which employs both of the explicit and implicit techniques) outperforms significantly the version of PL-PPF, which employs only the explicit techniques. This is attributed to the effectiveness of the rules of predicate logic in inferring the functional terms that co-occur implicitly with proteins in biomedical texts. As Fig. 7 shows, PL-PPF outperformed DeepGO in the GO Biological Process and Cellular Components subontologies. 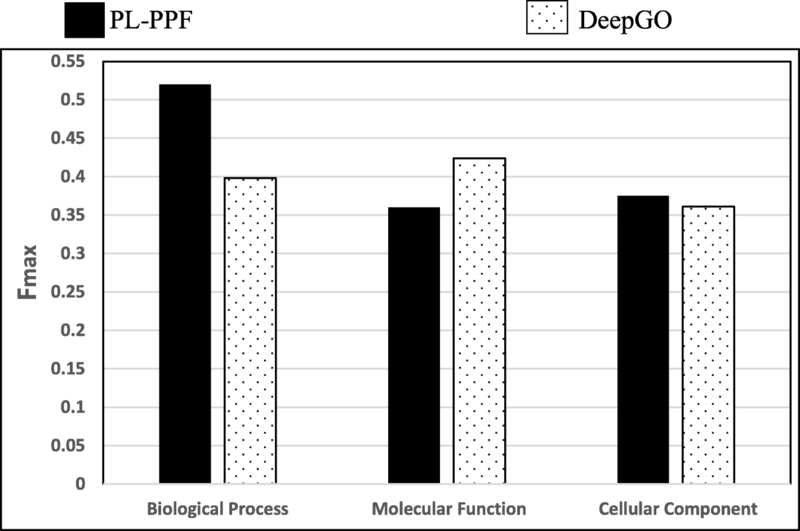 However, DeepGO outperformed PL-PPF in the Molecular Function subontology. 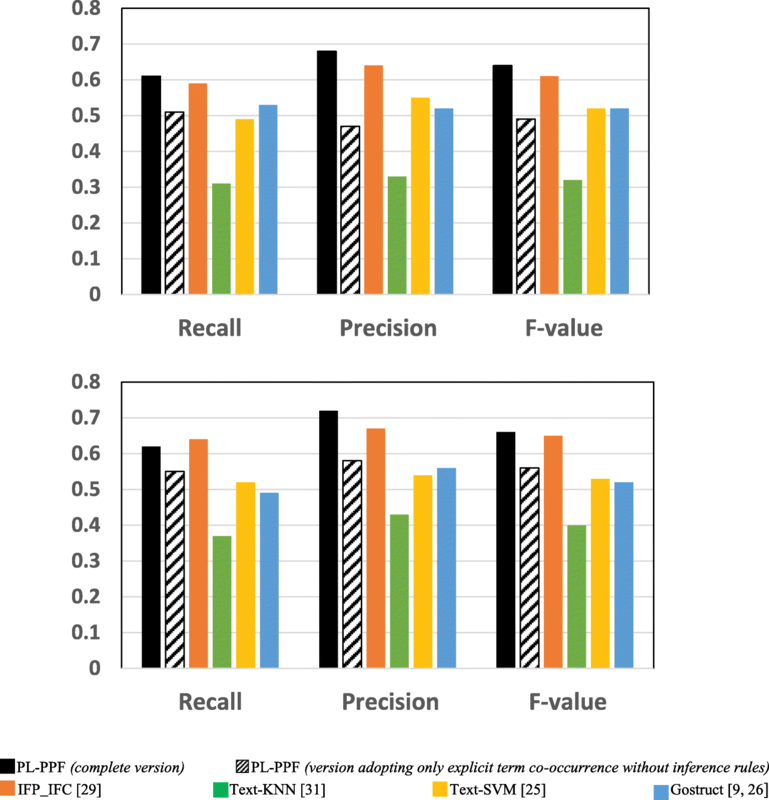 Actually, we observed that PL-PPF performs better in the Biological Process dataset then the Molecular Function dataset in all conducted experiments including the ones described in “Assessing the results returned by the systems through 5-fold cross validation” and “Assessing the results returned by the systems through cumulative-validation” sections. We will investigate the root cause of this in a future work. As Figs. 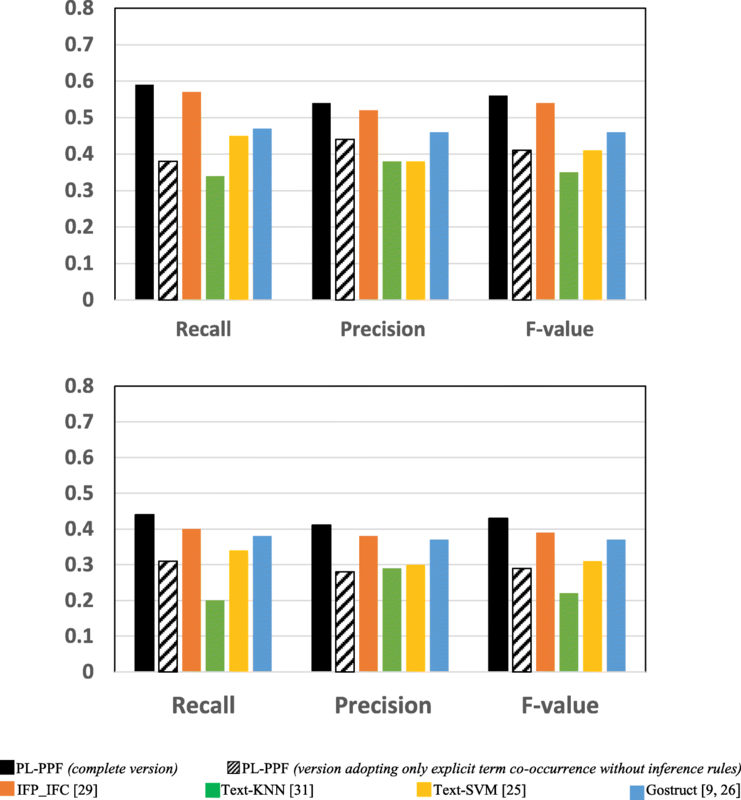 5 and 6 show, the Recall and Precision values of the systems get better as the sizes of proteins, whose associate biomedical texts are used as a training dataset, increase. 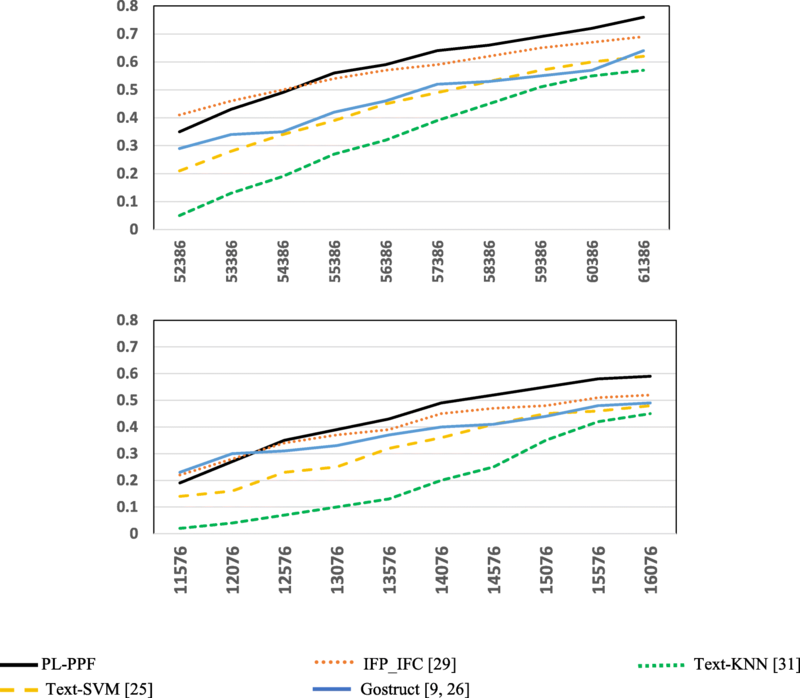 However, the Recall and Precision values of PL-PPF and IFP_IFC increase at higher rates. When the set of training texts is small, it would not have enough sentence structures. As a result, PL-PPF cannot accurately determine whether the sentences have solid relationships between their terms. Therefore, as the size of training biomedical texts gets larger, the z-score values computed by PL-PPF for determining semantically related terms become more accurate. This is advantageous for PL-PPF, since the size of biomedical texts associated with proteins in real-world increases significantly over time. As Figs.3 and 4 show, PL-PPF predicts the functions of GO annotation terms at lower hierarchical levels with better accuracy than higher-level ones. In general, we attribute the performance of PL-PPF over the other five systems to the fact that PL-PPF employs a combination of statistical and logic-based approaches while the other five systems employ only statistical-based approaches. That is, PL-PPF includes a combination of statistical-based explicit term extraction component and logic-based implicit term extraction component. Our hypothesis is that important biological molecule terms pertaining functional categories are likely to co-occur implicitly with proteins in biomedical texts. Table 10 shows the percentages of valid explicit and implicit terms that PL-PPF identified in the datasets used in the experiments. For each of the GO and SDG datasets used in the experiments, Table 10 presents the percentages of terms in the Biological and Molecular Function ontologies identified by PL-PPF. As the table shows, the percentages of implicit terms that PL-PPF identified are considerable. Some important biological molecule terms pertaining functional categories may implicitly co-occur with proteins in biomedical texts. Most current information extraction approaches do not take advantage of such implicitly inferred terms and focus solely on explicitly mentioned terms in texts. In this paper, we introduced an information extraction system called PL-PPF. The system predicts protein functions based on both explicitly and implicitly mentioned functional terms in biomedical texts. PL-PPF extracts explicitly mentioned functional terms in texts using computational linguistic techniques that identify semantically related terms in differently structured forms of sentences. It extracts implicitly mentioned functional terms by recursively triggering protein specification rules using the standard inference rules for predicate logic. We compared PL-PPF experimentally with the following five systems: DeepGO , IFP_IFC , Text-KNN , Text-SVM , and GOstruct [9, 26]. Results showed that PL-PPF outperformed the other systems in terms of inferring the functions of proteins from both the GO  and SGD  datasets. We also evaluated the impact of inference rules in inferring implicit functional terms by comparing two versions of PL-PPF: one adopts only the explicit techniques and the other is a complete version (i.e., adopts both of the explicit and implicit techniques). Results revealed that the complete version outperformed significantly the other version. This is attributed to the effectiveness of the rules of predicate logic in inferring implicitly mentioned functional terms in texts. This research work was funded, in part, by ADEC Award for Research Excellence (A2RE 2016), Abu Dhabi, UAE; Grant No. 3108. KT conceived, designed, and supervised the project. KT, YI, and AA carried out the implementation of the project and the experiments. KT and YI wrote the manuscript and analysed the results of the experiments. All authors read and approved the manuscript. SGD (Saccharomyces Genome Database). Available at: https://downloads.yeastgenome.org/curation/.